Our favorite way to use up leftover ham: Ham Bone Soup. 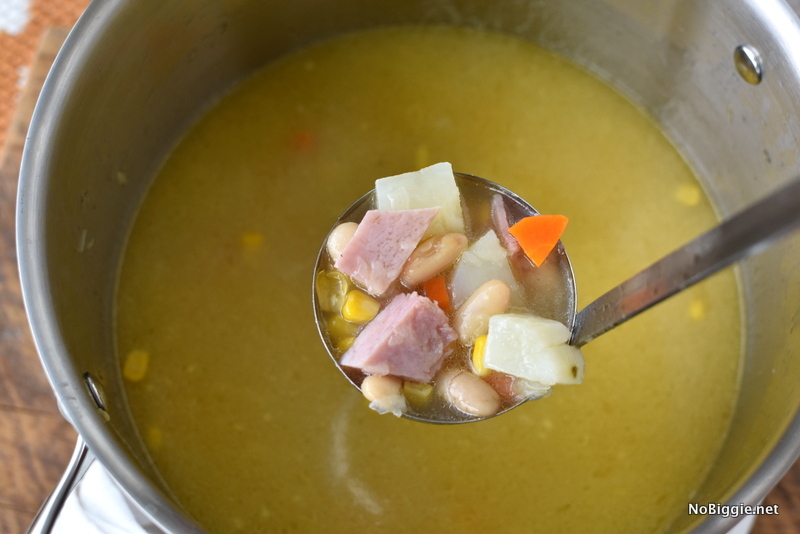 Don’t throw out that leftover ham bone…instead make soup…Ham Bone Soup! You can freeze the ham bone and use it when you’re ready, or you can make this soup for dinner the next day. 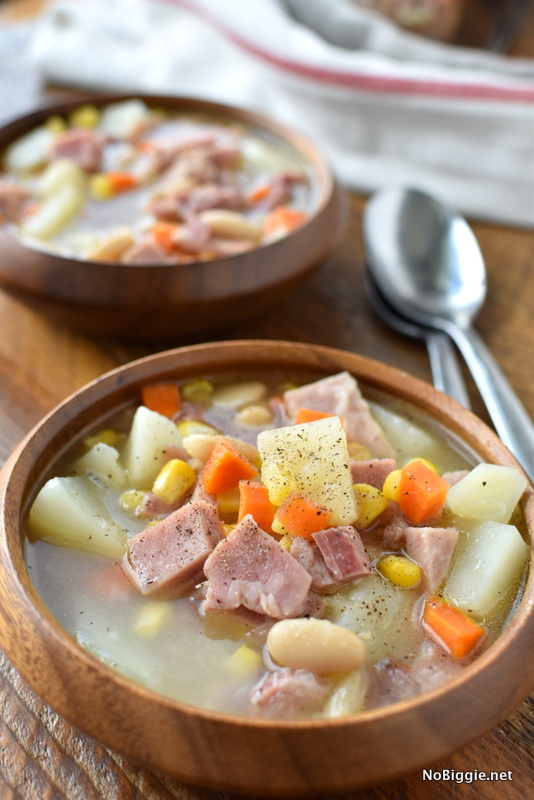 This soup is loaded with chunks of ham, white beans and lots of veggies. It’s hearty and so delicious! 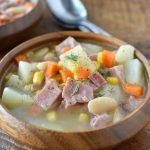 Next time you have a big ham…like from a big holiday or family gathering, don’t throw out the ham bone, it’s full of flavor, plus there is usually enough meat still left on it to make this yummy soup. We made a quick video so you can see it in action. It’s one of those meals I crave year round. Pure comfort food, don’t you think? 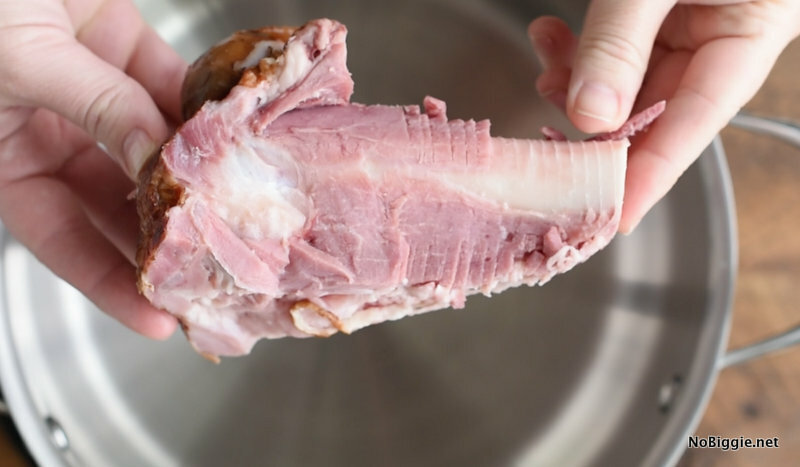 Place leftover hambone in a large pot and cover with water halfway, about 6 cups of water. Bring to a boil. Reduce heat and simmer until very fragrant, about 30 minutes to 1 hour; remove and discard hambone. Add garlic, onion, carrots and potato. Cook, stirring occasionally, until onions become translucent, about 2-3 minutes. Stir in ham stock, beans and corn; season with salt and pepper, to taste. Bring soup to a boil; reduce heat and simmer until potatoes are tender, about 10-12 minutes. Stir in diced ham and serve warm. I’m excited for you to make it soon!